Crystalline Green Ray has a soft gradual energy that contributes to more cheerful, pleasant people entering your life. It has a vibration of happiness and joy for life that flows outwards throughout your life. It gives you a deeper connection with nature and with plants, trees and animals; and with Mother Gaia herself. The energy also carries a strong vibration for change. If you are passion about about the earth and feel that it is time to step forward to heal the earth this energy will be of benefit to you. 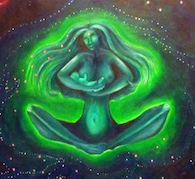 This system is helpful to connect with Mother Gaia and the energy of the natural world and may be used in Earth healing Rituals. It may challenge you to feel more respect for all life, including animals. The energy may benefit your pets as well. Crystalline Green Ray helps you to understand who you really are. It resonates within the heart chakra, and may aid you to make contact with nature spirits, elemental beings and other members of the Devic Kingdom. Crystalline Green Ray assists you in feeling more emotionally balanced. It may strengthen relationships as it brings a stream of happiness, joy and contentment to your life, which flows through to those with whom you are in contact with. This system may help you recall your purpose for being here on Earth at this time, and may bring you personal healing. It may assist with detoxification of your body with its strong cleansing action and is helpful to cleanse the kidneys and heal skin rashes. It may boost the immune system and revitalize liver function.